A couple of days ago, my little girl asked me, "Why is Santa still out?" 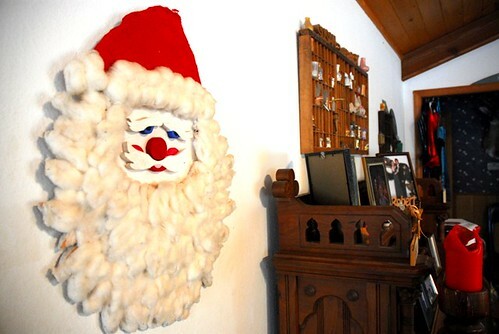 She was, obviously, talking about the Santa head which was on the wall; which has been on the wall for six months; which will probably stay on the wall until Christmas, and may very well stay right there until the end of all time. It's not that it's hard to take down. A person so inclined could do it in a jiffy. It's not that I'm too lazy to do it, which I am, but that's not the point. It's not that I love Christmas so much that I need to have all my Christmas decorations and lights and Santa Clauses and Snowmen and trees and sleighs and elves all around, year around, just hanging around. No, Santa is still hanging on that wall because...I just haven't gotten around to taking him down. Maybe I'll put that on tomorrow's "To-Do" list.